The Golden S Bridge which is still under construction will connect the Kuching Waterfront to the Astana and new DUN Building. KUCHING: The almost- completed pedestrian Golden S Bridge at the KuchingWaterfront will benefit not only tourists visiting Kuching, but also encourage people staying on the other side of the river to park their vehicles and walk across instead of driving the long way via the Satok bridge. In saying this, Minister of Tourism, Arts, Culture, Youth and Sports Datuk Abdul Karim Rahman Hamzah added the brigde will also provide good connectivity to those living on both sides of the river. 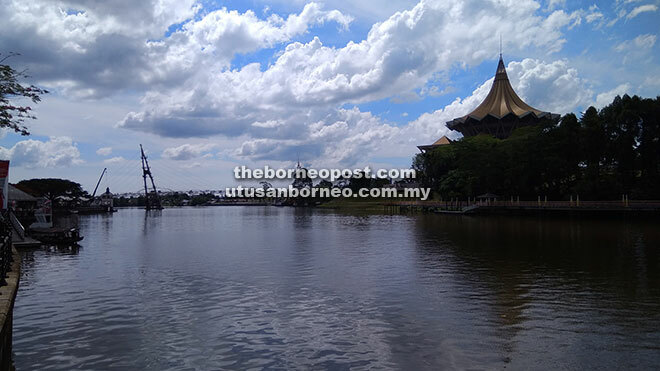 “When people come to Kuching, they want to take photos with the new DUN (State Legislative Assembly) Building or the Astana in the background and the S Bridge is perfect for this,” he said in a phone interview yesterday. Asked if it was possible for the bridge to be opened to the public by next month as reported on a Facebook page, he said he did not think so because the bridge would need to be certified first. When asked if the ‘penambang’ or traditional boatmen will be affected once the bridge is open, he said they were already affected a long time ago when the Tun Salahuddin bridge and the Satok bridge were built. He pointed out providing ‘penambang’ services is a sunset industry, and that even now, the boatmen are very much being helped to ply their trade, more so for the tourists. Meanwhile, boatman Samad Junjeng, 52, said that there are over 100 boatmen working along the waterfront but because they have their designated jetties, only the ones plying the Astana route will be affected. The affected ones are those who ply the bronze crocodile jetty to the Astana jetty. “I get around RM30 per day, and I have been working for 25 years. There are four groups of boatmen who take turns to work the river. We work for a week and rotate to the next group, and one week there’s about five of us working. So in total there are about 20 of us. Another boatman, Saini Bujang, said that things were tough as it is even before the bridge opens as fewer people use boats to cross the river. “On average I get between RM20-30 a day and if there is a group of tourists or it is a public holiday or there are events here, I can earn a few hundred a day. The going rate is RM1 per person per way. Once the bridge opens, I fear that my earnings will drop significantly. Hopefully we will get some compensation for this,” he said when met at the jetty yesterday. He has been working as a boatman for over 20 years. The ‘penambang’ boat rides operate from 6am to 6.30pm daily. On this, Abdul Karim said that not many people use the boats at that location as the Boyan-Gersik-Sourabaya Waterfront folks use the boats that land at the White Rajah Restaurant (formerly Khatulistiwa). The Golden S Bridge, which links Pengkalan Batu to Pengkalan Sapi, was launched by then Chief Minister Tun Pehin Sri Abdul Taib Mahmud in 2013. The 400m bridge will measure 3.25m in width and loom 12 meters above the water.